I have several album cover shirts, and this one happens to be my favorite album. Represent! 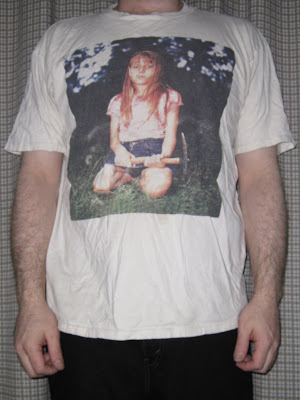 I have to admit that this shirt, which showcases a striking pre-pubescent girl has raised its share of eyebrows. 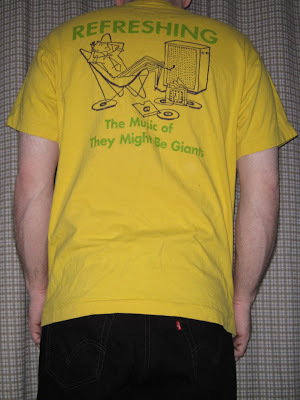 I think that this says more about these arched-brow wearers then they might think the shirt says about me. 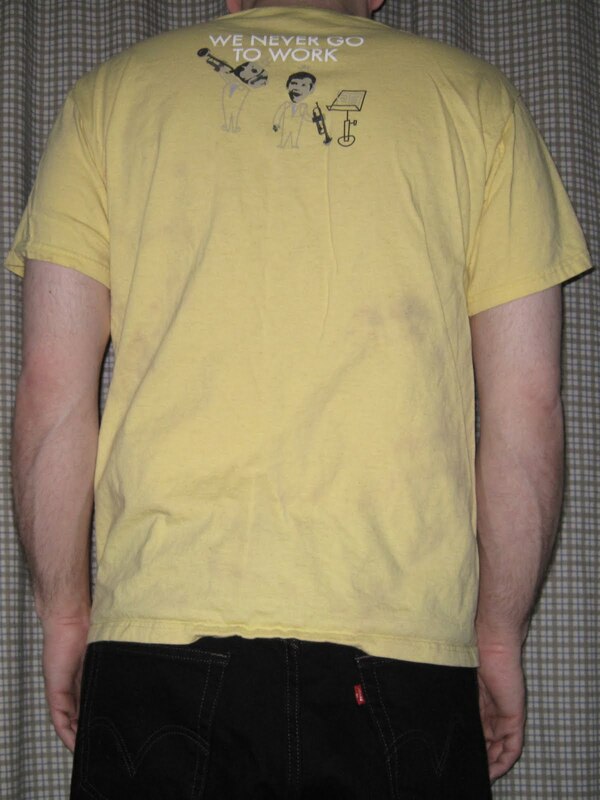 On the back of the shirt, what else? The back cover. Just a bit faded. 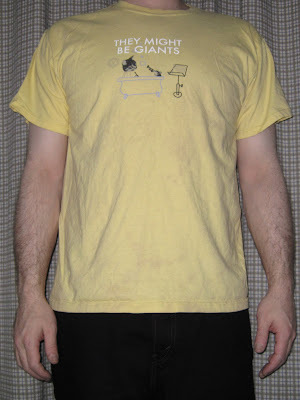 Design by Mike Mills. A funny little song performed in London, England on 8/28/89. 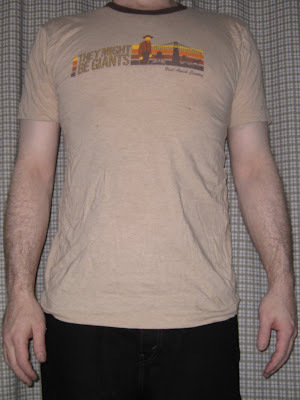 Oh no, no, I never wear this shirt. Well, that's not exactly true.. 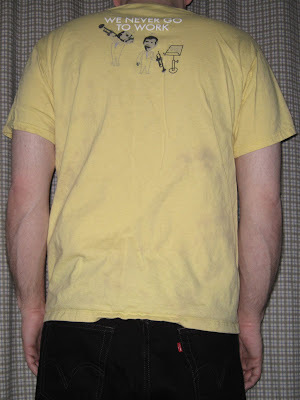 I do wear it occasionally. It's just that yellow isn't my color. 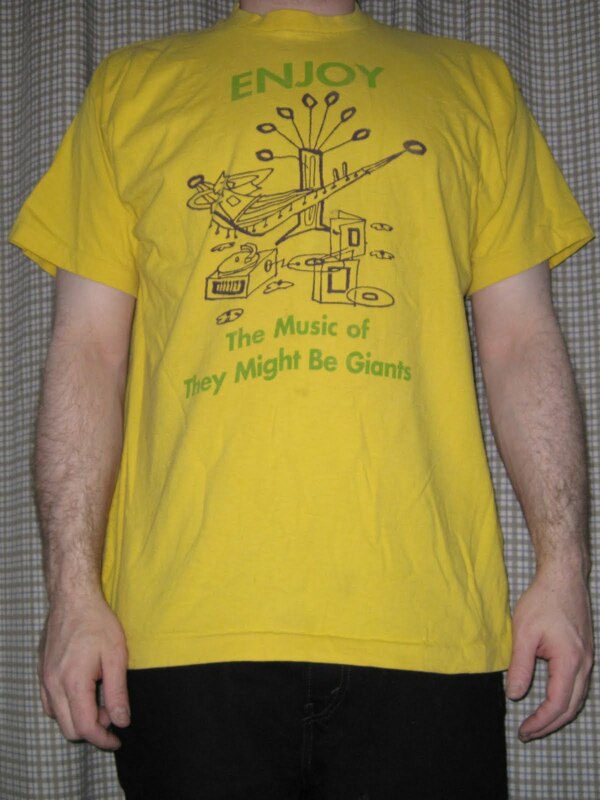 Neither is red, but that usually won't stop me from buying yet another TMBG shirt. On the front is the standard cat-and-mouse instrumental bathathon. On the back is a child taking trumpet lessons from a dog-headed boy. Nothing weird about that. "WE NEVER GO TO WORK" is inscribed above. Buy "Work on Yellow" now at the TMBG Merch Store. 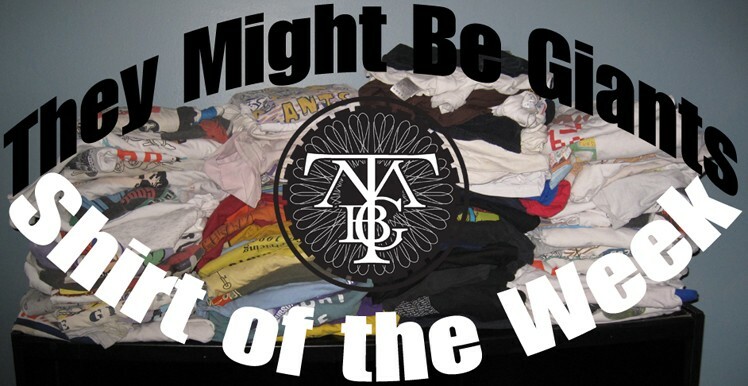 Here's the fun video that the images were borrowed from that snuck onto the Here Come the 123s album disguised as "7 Days of the Week". 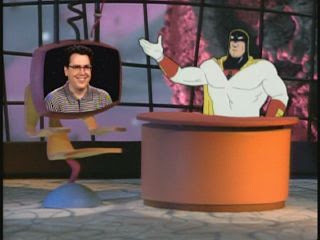 It was animated by David Cowles and Sean McBride, so I suppose that they deserve credit for the shirt, as well. An instrumental show opener that usually included band introductions. Performed at The Bowery Ballroom in New York City on 4/20/00. Appropriate Earthen tones accompany this fitting tribute to the Amish people. "Visit Amish Country", an Amish giant invites. 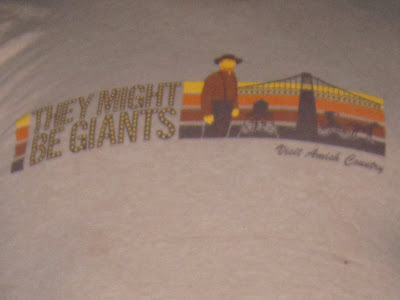 And in fact, TMBG soon will be visiting Amish Country with a show in Lancaster, PA on July 28. 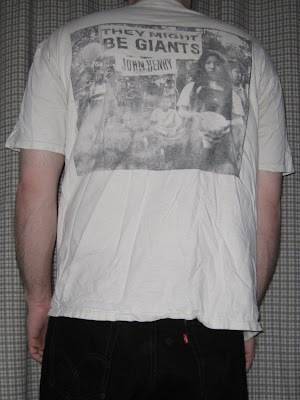 See you there, possibly wearing this very shirt! Get yours now, from the merch store. Here's a better look at the design. Friendly! 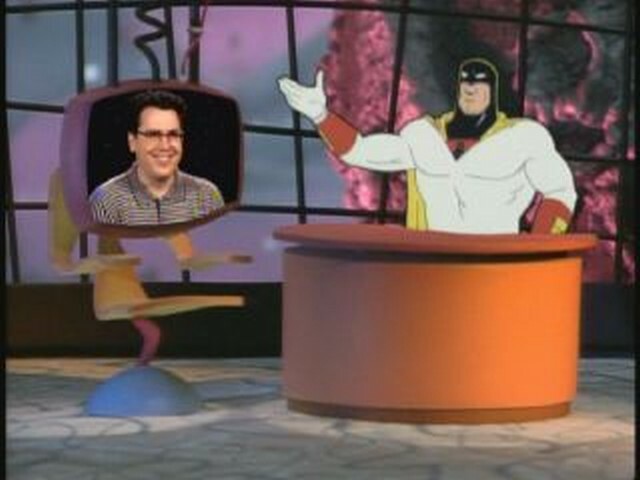 John talks about his (still unaired) appearance on Cartoon Network's wacky talk show, Space Ghost: Coast to Coast during a radio appearance on 2/2/97. 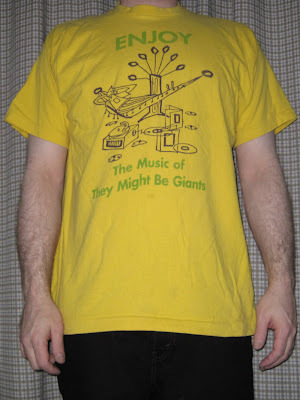 "ENJOY The music of They Might Be Giants", this shirt requests. Pictured is a gentleman relaxing in a hammock while listening to his favorite music on the hi-fi. On the back, another fan kicks back and does the same. REFRESHING: The Music of They Might Be Giants! 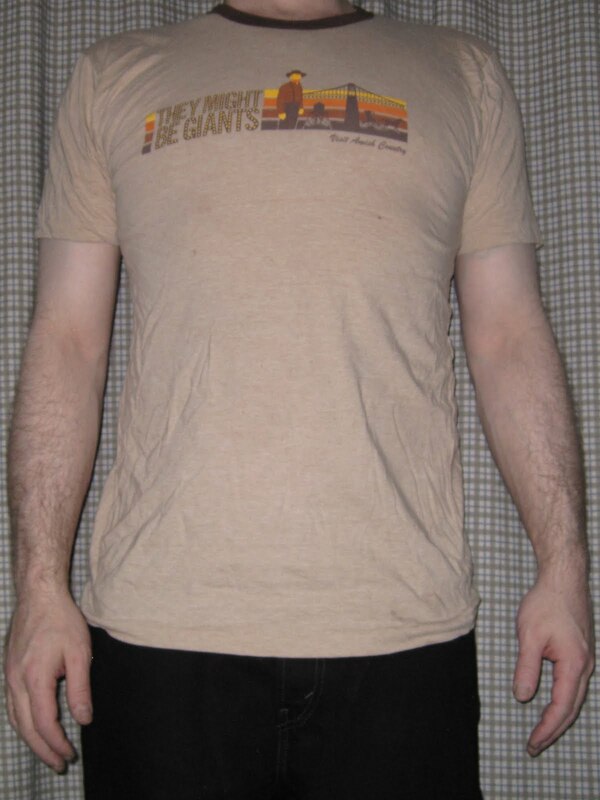 I also have this one in orange. The infamous stage collapse accident @ The Modjeska Theater in Milwaukee, WI on 10/5/92. Listen closely at :44 to hear the stage collapsing.